Job in a nutshell: Building and maintaining financial models to help our business units allocate general ledger costs to customers and products. Mr. Excel book – My job is very Excel-driven; I do a lot of analysis for special projects. I’ll admit it – sometimes I’m challenged with new or complex Excel functions, and Mr. Excel comes in very handy. Gum – I chew gum throughout the day, everyday! It keeps me from snacking. Yeti – It says “Aloha!” on the side and reminds me of one of my favorite vacation spots. I’ll let you guess where. Coaster – I live by its message everyday. I can be prone to worrying, and this was a gift given to me by a dear friend to remind me that worrying should not be my focus. Notes – I live by taking notes. I like to have something tangible to use as a guide instead of asking repeat questions to my supervisor. Also, if I’m struggling to understand something, I study my notes to try to figure out a solution. Job in a nutshell: Connecting dots, building bridges, and finding ways for people, data, and systems to achieve better outcomes for everyone. Pen & Blank Paper – I am often in meetings and this is a great place to start. The manual process of writing seems to help my recall of potentially useful information as much as the actual notes do. Headphones – After reading Disconnect: The Truth About Cell Phone Radiation, What the Industry Has Done to Hide It, and How to Protect Your Family (Davis, 2010), I refuse to talk on a cell phone without a wired- or Bluetooth connection. When my kids were younger, I banned them from talking more than 30 seconds on a cell phone without a headset or at least a finger’s width of air between their head and the phone… but I digress. My point is that I always have headphones handy. An Innerspring – I work for a company whose past and future fortunes are tied to making products which improve people’s lives. I keep a spring as a reminder of both what we do and the folks who make it happen. Coffee Mug – Having a mug in my hand gives me a physical reminder to be a better listener (can’t talk and drink at the same time!) and sets a more conversational tone for meetings. Also, the HydroFlask mug was a Father’s Day gift that can keep coffee hot for hours… it’s remarkable! Post-It Notes – For important “focus” items. So nothing falls through the cracks. It’s a very sophisticated system. Job in a nutshell: Assisting to install, configure, and monitor Corporate’s servers and file storage appliances, as well as assisting with server-based applications and utilities. Travel Book – I just got back from a vacation to Europe! Before I left, I enjoyed thumbing through the book during lunch. It was exciting to plan out my trip! Coffee – Morning and afternoon coffee helps maintain my focus throughout the day. A Favorite Photo – I remember the day this was taken of me and my girlfriend. I recently moved from Arkansas, and seeing this photo reminds me that I moved here, in part, to be closer to her. I’m grateful to have landed an opportunity with L&P. Backpack – In addition to holding my work laptop, it holds a few tools in case I need to go perform some work on a server. Pad of Paper – When I need to remember something important about an application or server, it helps me to write it down as opposed to just typing it out. Want to see more? It’s been a minute since we’ve worked on this series, but we’re back! 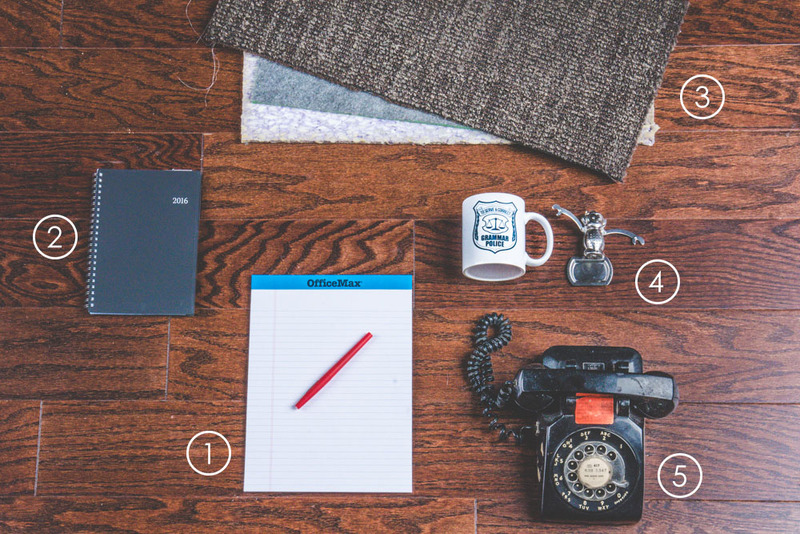 Check out a few Office Must-Haves from the past. Job in a nutshell: Helping to analyze and acquire companies that can strengthen Leggett’s portfolio of businesses and improve shareholder returns. Cleats – If time allows, I’m always up for some lunchtime soccer. A group of employees regularly plays on the field across the street! It’s a great way to get a workout and meet other people around L&P. Water Bottle – I am not a huge coffee or tea drinker, even though I’ll have them once in a while. I am all H2O (well, about 60% if you want to get scientific here). I go through 2 or 3 of these bottles a day. WSJ – Good ol’ Wall Street Journal – my way of staying plugged in to the world around me. Sticky Notes – When I’m in the middle of a mergers and acquisitions (M&A) deal, things happen fast – really fast. Sticky notes to the rescue. I usually jot down my new to-do’s and stick them on my monitors, a method I borrowed from our former treasurer! Notebook – This is a must when I am headed to a meeting. Tough to replace plain old paper and a pen… it’s just so efficient! And the leather is fancy. If you want to get to know Leggett & Platt, you should get to know our people first. What better way for you to do that than by seeing a few of their favorite things. Job in a nutshell: Leading a team that ensures the accuracy of Leggett’s financial information, reinforces the integrity of internal controls, and continuously improves existing processes. Calculator – Because I’m an accountant. Dilbert Calendar – Deadlines are important in accounting: month-end, quarter end, year-end, plus quarterly and yearly audits. This calendar keeps me up-to-date and on track, while Dilbert keeps me laughing. Red Stapler – It’s a Swingline. I’m honoring a great movie by keeping this stapler on my desk. Fountain Pen – I write with a fountain pen because it’s like a trip back in time. Mr. Potato Heads – This is just a sampling of my collection! My first two Mr. 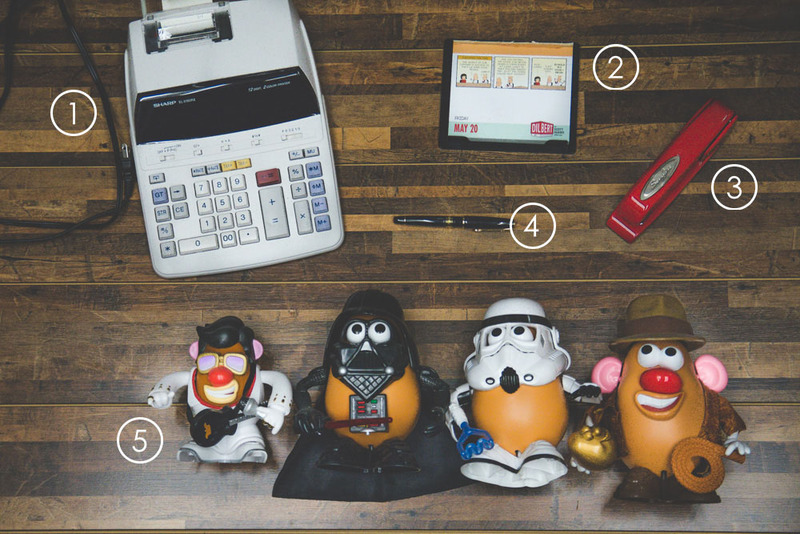 Potato Heads were Darth Spud and Spud Trooper from Star Wars. I saw them in an ad and my wife surprised me with them for Christmas. Over the years, my team members have gifted me many others to expand my collection. Want to see more? Check out the series introduction. Job in a nutshell: Helping operations maintain federal and state regulatory environmental compliance and implementing the Eco Initiative. Jacket – My office is freezing! Calendar – Call me old school, but I can remember better if I physically write down meetings, appointments, and to-do’s. iPhone Mobile Charging Pack – I travel a few times per month for environmental audits. The charging pack holds three full charges for my iPhone, which allows me to pass time at airports and on flights. I hate worrying about a dead phone! Coffee – My morning pick-me-up. I prefer two cups in the morning (maybe one in the afternoon) and I take it black — no cream, no sugar. 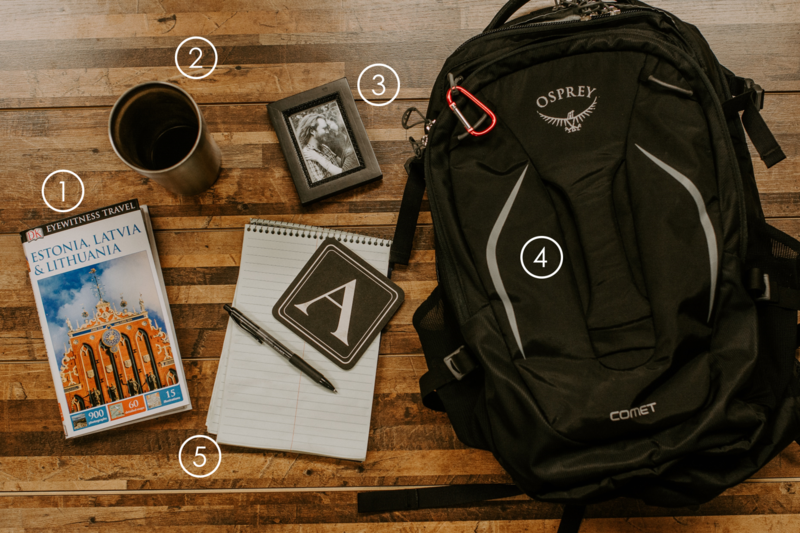 Map – Whether by map or GPS, I’m always navigating new cities. I have a giant map of the United States on my office wall, and it helps when I’m planning the next few months of travel for work. Job in a nutshell: Managing the systems and data used to recruit, set goals, review performance, develop employees, and conduct succession planning. Notebook – Whether scribbling in a notebook or typing in OneNote®, I’m constantly taking notes. These tools help me learn, remember, and stay organized. Standing Desk – I switched from a regular desk to a standing desk last year and never looked back. Standing makes me feel more energetic and focused throughout the day. 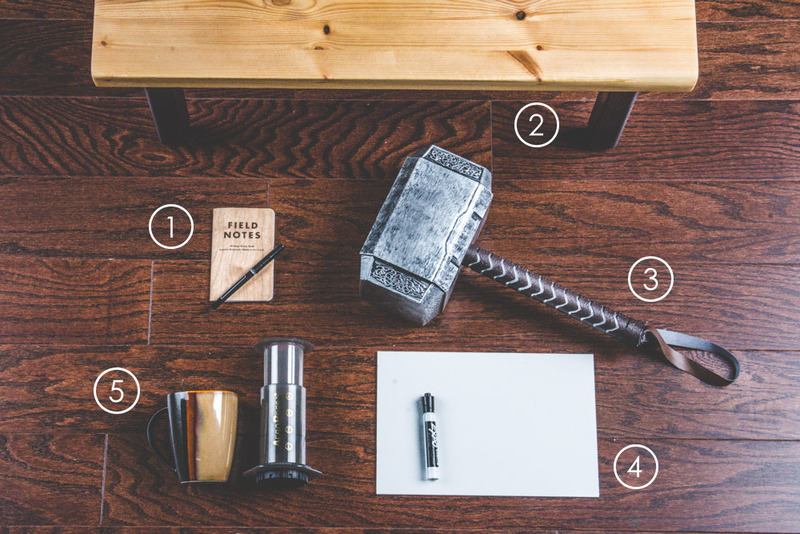 Mjölnir – The hammer of Thor. Because why not. Dry Erase Board – My office has a 4’ x 6’ metal board which is perfect for sketching mock-ups, tracking projects, and drawing the occasional comic book character. Coffee – I’m a 2-3 cups-per-day kind of guy. I keep an AeroPress® in my office so that a great cup of coffee is always within reach. Job in a nutshell: Drawing, writing, and using other learning strategies to contribute to the professional development of employees. Books – I’m new to the world of Adult Learning and Instructional Design, so I do a LOT of industry reading for work. The book I’m currently reading: Design for How People Learn by Julie Dirksen. Recording Microphone – Part of my job at Leggett & Platt includes recording voiceovers for on-demand learning like software tutorials and e-learning courses. Marker Board + Eraser – I write scripts, class outlines, and copy for mass email. I also create vector graphics and choose images for our live presentations. The brainstorming for all my projects starts here, on a marker board. 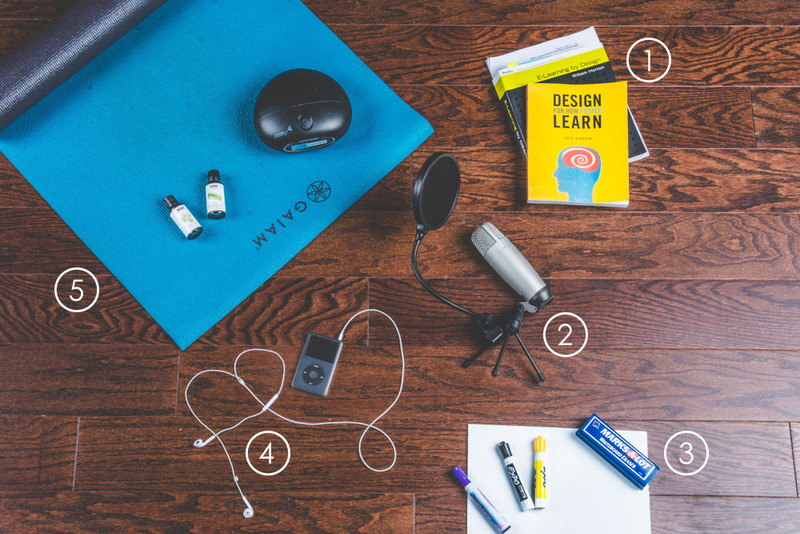 Headphones + iPod – This is a creative brainstorming essential! I’ve been caught all-out dancing in my office more than once, but I won’t apologize. It gets my creative juices flowing! The most recent jam I’ve been playing on repeat: Lose It by Oh Wonder. Yoga Mat + Essential Oils + Diffuser – I really do keep these items in my office at all times – because I’m a total hippy. Job in a nutshell: Lots of writing, usually about wire, wire-forming, wire-related products, and products made out of wire. Red Pen + Notepad – A red pen and a blank page are a writer’s best friends. Planner – With all the technology available to keep me organized, I still rely on a planner. I find that writing things by hand helps me remember better, and I love the feeling of checking off a to-do list. Carpet Cushion Squares – After these carpet cushion squares starred in a photo shoot for a work brochure, I nabbed them to create a more comfortable floor for my standing desk. Repurposing carpet cushion that’s made of recycled material? I call that a win. Monkey Tea Infuser + Mug – I start every day with a cup of tea. Then I drink three more throughout the day. Lately I’ve been on a peppermint tea kick, but I don’t discriminate. Rotary Phone – For calls from the President, or for when I’m feeling nostalgic for a simpler time.